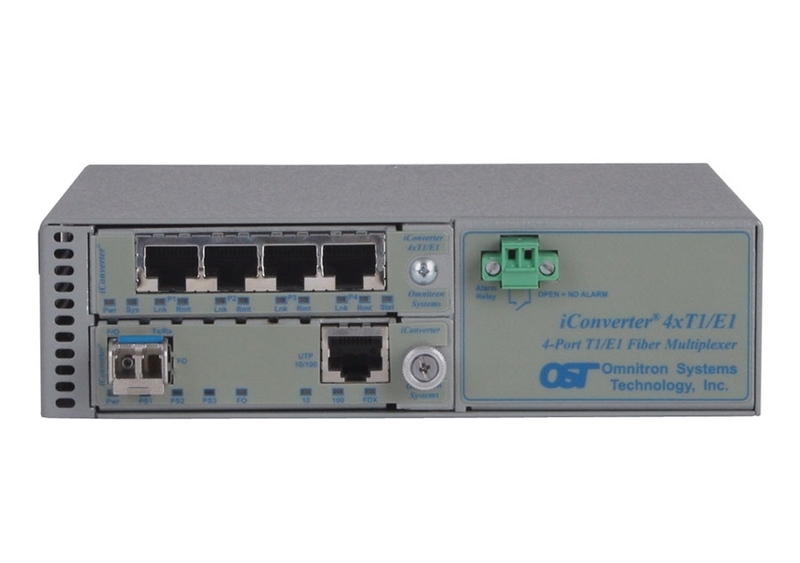 The iConverter 4xT1/E1 MUX multiplexs up to four T1/E1s and an optional 10/100 Ethernet onto a fiber optic transport link. The unmanaged T1/E1 Multiplexer provides an easy to use and cost effective multi-service solution. The iConverter 4xT1/E1 MUX multiplexs up to four T1/E1s and an optional 10/100 Ethernet onto a fiber optic transport link. The unmanaged T1/E1 Multiplexer provides an easy-to-use and cost-effective multi-service solution for providing TDM and Ethernet connectivity. 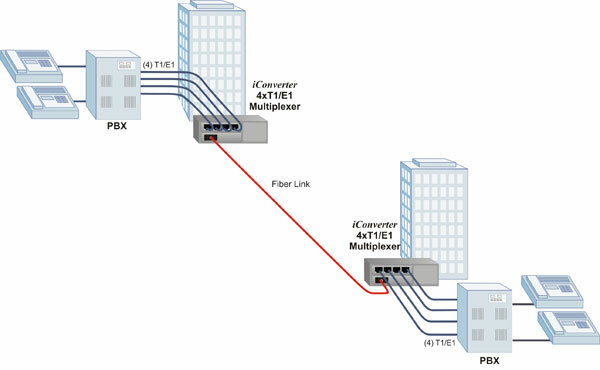 The iConverter 4xT1/E1 MUXes operate in a back-to-back configuration, with one multiplexer at each end of the fiber link. The 4xT1/E1 MUX transports services from legacy TDM equipment across long distances that exceed the reach or capacity of copper. This includes applications such as T1/E1 extension, mobile backhaul and building-to-building PBX connectivity, making it ideal for Enterprise, Telecom and Utility industries. The 4xT1/E1 MUX supports Small Form Pluggable (SFP) transceivers, enabling adaptability to different fiber types and distances, and support Coarse Wave Division Multiplexing (CWDM) technology to increase the bandwidth capacity of fiber infrastructure. The 4xT1/E1 MUX fixed fiber models support multimode and single-mode dual fiber with ST, SC and LC connectors; and single-mode single-fiber with SC connectors. The 4xT1/E1 MUX supports standard T1, E1 and Primary Rate Interface (PRI), voice or data. The MUX also supports AMI, B8ZS and HDB3 line codes. DIP-switches provide easy configuration of the T1/E1 line codes and line build-out. The copper interfaces feature four RJ-48 connectors for balanced T1/E1 applications. An optional adapter cable is available to convert each RJ-48 interface to a BNC interface for unbalanced E1 transport applications. The 4xT1/E1 MUX features user-selectable local loop-back on both the copper and fiber ports, remote fiber loop-back and circuit test modes. This functionality facilitates diagnosis of the remote unit, and minimizes the need for test equipment and support personnel at each end of a link. Alarm relay and LEDs provide fault notification for loss of power, LOS and AIS. The 4xT1/E1 MUX is a compact, unmanaged standalone unit available in both AC and DC models. The AC model accepts AC power input ranging from 100VAC to 240VAC, 50/60Hz, while the DC model accepts 18VDC to 60VDC. 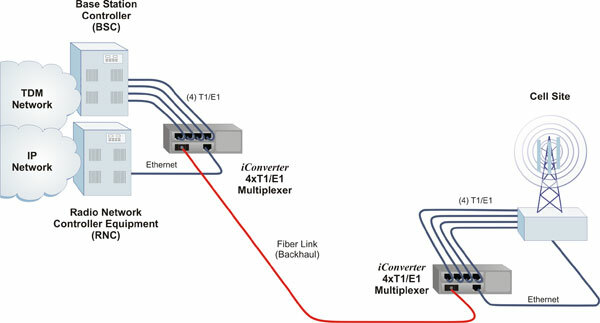 In this application, four T1s are extended between two PBXs using an iConverter 4xT1/E1 MUX at each end of a fiber link. Multimode or single-mode fiber can be used, and fiber links can be extended up to 120km using single-mode fiber. In this application, a pair of iConverter 4xT1/E1 MUXes are used to extend up to four T1s from the TDM Network and an Ethernet connection from the IP Network to a Cell Site. The 4xT1/E1 MUX provides a cost effective multi-service platform capable of delivering Ethernet and TDM services over a fiber link. Multimode or single-mode fiber can be used, and fiber links can be extended up to 120km using single-mode fiber. Contact Omnitron for other fiber options, extended temperature (-40 to 75°C) and RoHS (5/6) compliant models. When ordering the optional 10/100BASE-T Ethernet port, add a "U" before the first dash "-" in the model number.